048 or 3 of 50 on The Establishing Shot’s ULTIMATE JAMES BOND GUIDE TO LONDON OR 50 PLACES TO VISIT BEFORE SEEING SKYFALL is is visiting The Mount Street Galleries to see The 007 Project Bond Exhibition and possibly purchase a piece of James Bond history. 048. Leaving Scott’s after a late lunch across the road, by sheer serendipity I managed to get an exclusive preview and personal tour of The 007 Project Bond Exhibition from Mount Street Galleries owner and damn decent chap Damian Delahunty ahead of it’s secret star studded preview later that evening. 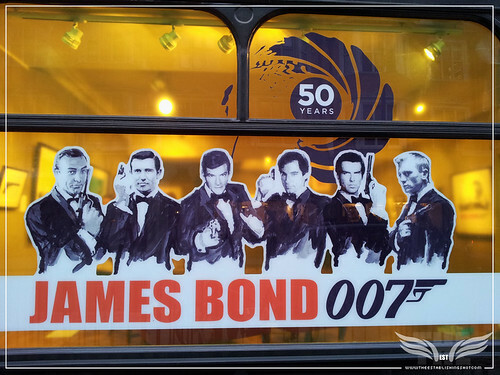 The Establishing Shot: THE 007 PROJECT - EVERYTHING OR NOTHING - 50 YEARS OF JAMES BOND EXHIBITION AT MOUNT STREET GALLERIES, a photo by Craig Grobler on Flickr. Damian took me through the genesis of The 007 Project as well as showed me some of the rather catching pieces created by Artist James Hart Dyke that would grace any James Bond fans collection, a set of original James Bond posters, Bond photography by Andy Gotts, as well as two absolutely stunning pieces (so much so that one of them actually sparkled as an object of desire) by legendary Bond artist and illustrator Robert McGinnis. A Year with MI6 was very successful and received both critical acclaim and wide spread international coverage which resulted in Barbara Broccoli and Michael G. Wilson at EON hearing about James, we gave them a private viewing of a few select pieces from James’s show about 2 or 3 months ago. 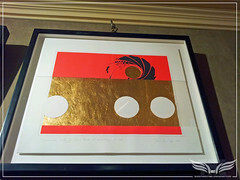 The Establishing Shot: EVERYTHING OR NOTHING - 50 YEARS OF JAMES BOND EXHIBITION AT MOUNT STREET GALLERIES - JAMES HART DYKE EVERYTHING OR NOTHING: THE UNTOLD STORY OF 007 – 50 YEARS OF JAMES BOND ARTIST PROOFS & PRINTS, a photo by Craig Grobler on Flickr. 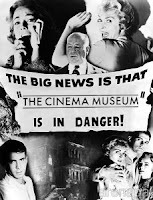 - as an idea of going back to this first film Dr No, you can see the references and bringing it up to date. The Establishing Shot: EVERYTHING OR NOTHING - 50 YEARS OF JAMES BOND EXHIBITION AT MOUNT STREET GALLERIES - ORIGINAL DR NO TEASER POSTER & JAMES HART DYKE EVERYTHING OR NOTHING: THE UNTOLD STORY OF 007 – 50 YEARS OF JAMES BOND PRINT, a photo by Craig Grobler on Flickr. 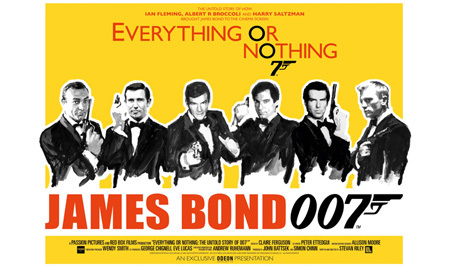 That resulted in joint collaboration between EON, The Mount Street Galleries and James Hart Dyke which brought forth James’s design for the Everything or Nothing: The Untold Story of 007 – 50 Years of James Bond documentary poster. On the back of that they gave us permission to release additional Prints. The image celebrates the six actors that have played Bond – Sean Connery, George Lazenby, Roger Moore, Timothy Dalton, Pierce Brosnan and Daniel Craig. 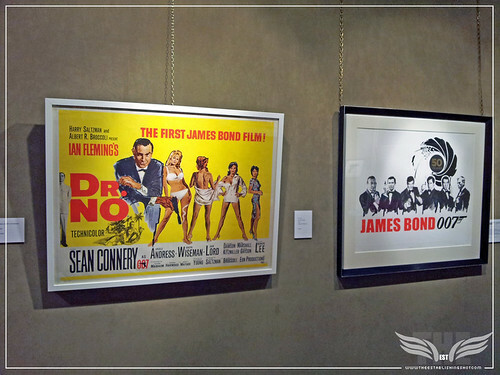 Hart Dyke sought inspiration from classic Bond movie posters of the 1960’s and 1970’s and in particular the iconic “Dr No” teaser poster of 1962 which is referenced in the yellow background of the main edition print. Of course Bond aficionados will know that Everything or Nothing is the origin of the acronym EON the name given to Harry Saltzman and Albert R. Broccoli's production company - EON Productions. I was very impressed with the breadth and number of different designs which got me wondering how long it took James to create the designs? The design happened very quickly, but these are actually proofs that you are looking at the actual silkscreen prints will be more intricate, for instance this would be embossed. These are proofs to show people, as the timing was important and we wanted to be ready in October for Bond’s 50th anniversary and the release of Skyfall. So they are still being produced, often with these thing it could take up to a year so it has been very tight - but we were lucky to be involved directly with Barbara Broccoli, Michael G. Wilson and David Pope the EON CEO. Over here we additional studies, what I call some fun stuff, but really extra studies into how James built it all up, explored different uses of medium and brought the concept together. 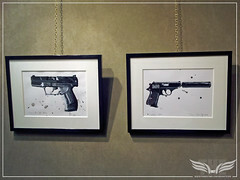 The Establishing Shot: EVERYTHING OR NOTHING - 50 YEARS OF JAMES BOND EXHIBITION AT MOUNT STREET GALLERIES - JAMES HART DYKE GLOCK & WALTHER PPK, a photo by Craig Grobler on Flickr. 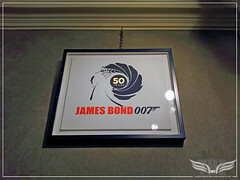 The Establishing Shot: EVERYTHING OR NOTHING - 50 YEARS OF JAMES BOND EXHIBITION AT MOUNT STREET GALLERIES - JAMES HART DYKE EVERYTHING OR NOTHING: THE UNTOLD STORY OF 007 – 50 YEARS OF JAMES BOND ARTIST PROOF, a photo by Craig Grobler on Flickr. 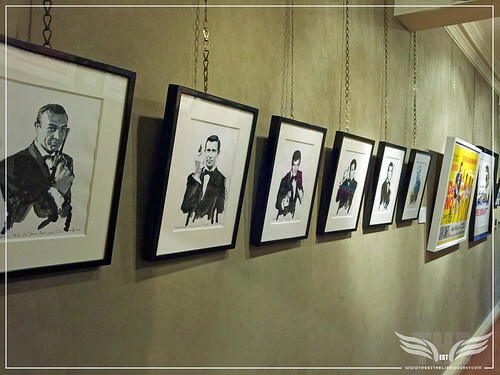 The Establishing Shot: EVERYTHING OR NOTHING - 50 YEARS OF JAMES BOND EXHIBITION AT MOUNT STREET GALLERIES - JAMES HART DYKE JAMES SET OF 6 STUDIES JAMES BOND 50th ANNIVERSARY ACRYLIC ON PAPER, a photo by Craig Grobler on Flickr. These are from a side project I did earlier in the year with Robert McGinnis. 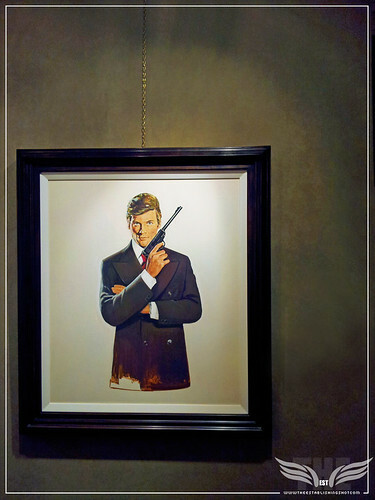 The Establishing Shot: THE 007 PROJECT EXHIBITION AT MOUNT STREET GALLERIES - JAMES BOND: A 1974 PREPARATORY PORTRAIT PAINTING OF ROGER MOORE BY ROBERT E. MCGINNIS, a photo by Craig Grobler on Flickr. This wonderful quality and striking image is one of the most iconic Bond poses from the early 1970’s and was initially a pose which was depicted by Robert McGinnis in the poster design for the 1973 Bond film “Live and Let Die” starring Roger Moore and subsequently used in poster and promotional material both for this film and “The Man with the Golden Gun” (1974). It is thought that in this unfinished preparatory portrait, McGinnis was adapting the original pose of Sean Connery from the “You Only Live Twice” poster (designed together with Frank McCarthey) for the Roger Moore campaign when he became Bond in 1973. On the back of that we did a study for Roger Moore’s Live and Let Die which Robert McGinnis has hand signed. 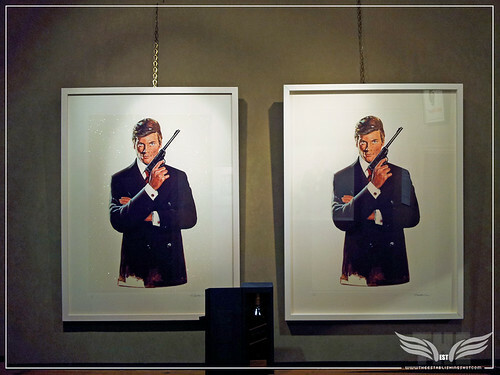 The Establishing Shot: THE 007 PROJECT EXHIBITION AT MOUNT STREET GALLERIES - ROGER MOORE - 007 BY ROBERT E. MCGINNIS SILKSCREEN PRINT ON PAPER WITH DIAMOND DUST AND GLAZES, a photo by Craig Grobler on Flickr. We also have this interesting portrait by Andy Gotts (Andy Gotts is a very sought after photographer renowned for his celebrity portraits) Andy was actually invited by Daniel Craig onto the set of Skyfall as Daniel’s personal photographer. Prior to that he did this very interesting portrait of Desmond Llewelyn tragically just the week before he passed. 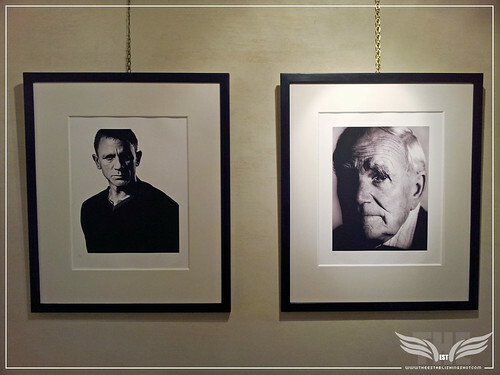 The Establishing Shot: THE 007 PROJECT EXHIBITION AT MOUNT STREET GALLERIES - ANDY GOTTS – SKYFALL DANIEL CRAIG (2012) & THE GLINT OF Q DESMOND LLEWELLYN (1999), a photo by Craig Grobler on Flickr. This is the final finished poster that was used for the Everything or Nothing documentary. 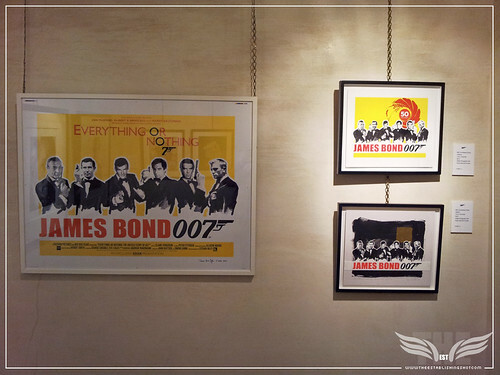 The Establishing Shot: EVERYTHING OR NOTHING - 50 YEARS OF JAMES BOND EXHIBITION AT MOUNT STREET GALLERIES – FINAL JAMES HART DYKE EVERYTHING OR NOTHING FILM POSTER & JAMES BOND 50th ANNIVERSARY STUDIES, a photo by Craig Grobler on Flickr. 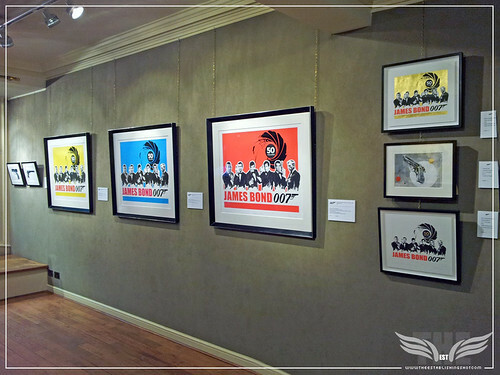 The Everything or Nothing – 50 Years of James Bond silkscreen prints are published by Mount Street Galleries in association with EON Productions. They have been produced by the celebrated Coriander Studio, responsible for the manufacture of fine art prints by artists such as Sir Peter Blake and Damien Hirst, amongst others. 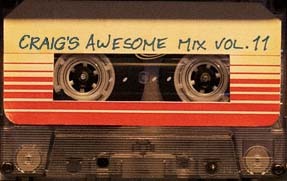 There are four different colourways available as follows: Yellow (Edition of 200), Red (Edition of 75), Blue (Edition of 75) and White with Gold Leaf (Deluxe Edition of 50).